There is a part on the tuna belly called “Sunazuri” or “Zuri” (gizzards). Normally “Jabara,” with the diagonal white lines is the king of tuna, but the fatty tuna is spoiled if the white lines are left in your mouth. 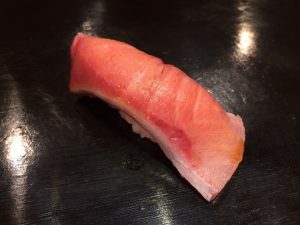 Instead, the knife cuts along those lines, gently removing the fish meat from them, making “Hagashi.” If the chef is not skilled, this cut will take time and extra meat is left behind. This is delicate work, making for a delicious and satisfying experience. 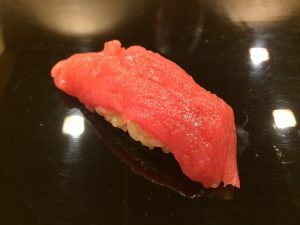 Posted on May 7, 2018 Categories EdomaesushiTags Inosinic acid, Maguro, Nigiri sushi, Umami4 Comments on What is “Hagashi”? Isn’t it true that fish is all about the freshness?? It’s a well-known fact among professional chefs that some fish don’t rely solely on freshness. Of course there is importance in freshness, but that’s just one element. It’s generally understood that flavor and taste improve with time (maturity). The umami* found in the meat of the fish is essentially inosinic acid and glutamic acid. After a certain amount of time has passed after a fish has died, the body stiffens and not long after that the rigor lets up. The inosinic acid, which the umami is composed of, comes after the fish has stiffened. It then accumulates in the process of the body relaxing. This is the same in beef and pork in which there is no umami in the meat unless it is hung and matured for a time. Therefore, ikizukuri sashimi that is still twitching usually won’t have the taste or depth of umami. However, the firm texture of sashimi is also an undeniable enjoyable aspect. It is not all about the umami. *Glutamic acid, Inosinic acid and Guanylic acid are representative components of umami. Guanylic acid is found in kelp and vegetables (tomato, Chinese cabbage, green tea, etc.) as well as Parmesan cheese, inosinic acid is found in fish (bonito, macheral, sea bream, etc.) and meat (pork, chicken, etc.) while Guanylic acid is abundant in mushrooms (especially dried shiitake mushrooms). 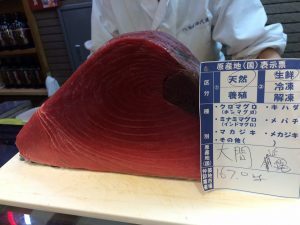 Posted on July 17, 2017 August 28, 2017 Categories EdomaesushiTags Edomae Shigoto, Glutamic acid, Inosinic acid, Nigiri sushi2 Comments on Isn’t it true that fish is all about the freshness? ?